There's no get-together quite like an afternoon tea party. Not only are they delicious but also elegant. You get to wear your loveliest clothes and eat beautiful looking finger food, which also tastes good, since plenty of it is loaded with sugar. And if you're into socialising, it's the perfect venue for showing off your refined manners without being out of place. What's not to love? I suppose morning tea could be included here too, but it doesn't have quite the same charm as afternoon tea. Morning tea is more likely to be some generic biscuit from a packet dunked into a cup of instant tea or coffee in a foam cup, before knuckling back down to work. It doesn't have the decadence of afternoon tea, after which we can go home at our leisure and have a good excuse not to cook an evening meal, because we're still full of afternoon tea. So without further ado, here are some of my favourite afternoon tea parties from the pages of stories. She doesn't realise what a mad tea party it will turn out to be until she gets there. It appears civilised enough, set up outdoors at the March Hare's house, with the Mad Hatter and a sleepy Dormouse in attendance. Alice is affronted by being told there's no room for her, since there's obviously plenty of space. She's offered a glass of wine, but there isn't any in sight. Then the March Hare dips his watch in a cup of tea. The conversation quickly gets ridiculous. Alice decides to leave soon after realising that she's crashed a perpetual tea party, because the others think it's permanently 6 o'clock. More on Alice here. In a generous mood, Marilla offers to let Anne host a tea party for Diana. Anne plans to serve cherry preserves, fruit cake, cookies, snaps, and raspberry cordial. But alas, that's not the only red hued beverage Marilla stores in the pantry. The drink which Diana declares the best cordial she's ever tasted turns out to be currant wine, and her three large glassfuls have catastrophic results. Poor Marilla hasn't made any wine for years, since finding out the minister doesn't approve. 'I just kept that bottle for sickness,' she says, but the damage is done. More on Anne here. A positive event brightens poor little Jane's early days at the harsh old Lowood School. Nice Miss Temple invites Jane and Helen into her private office, which has a cosy fire. 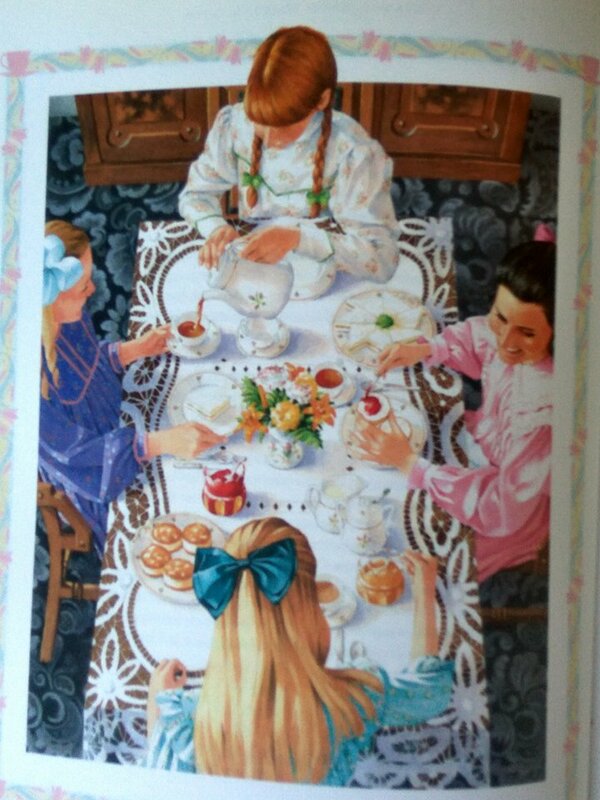 She treats them to a surprise tea table with china cups and a bright teapot. Mrs Harden, the dour housekeeper, refuses to supply more bread and butter, but it's okay, because Miss Temple has a delicious seed cake hidden in her chest of drawers. It's like nectar and ambrosia to the girls. My review is here. The children love climbing to Moonface's house at the very top of the Faraway Tree, where they share some most intriguing food. There are pop biscuits, which do just as they say; toffee shocks, that swell until your mouth can't contain them and then burst; hot cold goodies, with changing temperatures, and google buns, with massive amounts of sherbet packed inside currants. Enid Blyton's name isn't always the first we think of for fantasy stories, but she had some excellent, edge-of-the-seat tales. And she used the name 'google' for these buns long before it became popular for large numbers and search engines. On their way to school on the Hogwarts Express, the students always take the opportunity to indulge in tea parties in their carriages, supplied from the amazing delicacies sold by the trolley witch. On his very first trip, Harry had intended to stock up on Mars Bars, but then he discovers Bertie Bott's Every Flavour Beans, Chocolate Frogs, Pumpkin Pasties, Cauldron Cakes, Licorice Wands and all the other tasty things. He buys up big with his newfound wealth, which is most significant in cementing the friendship with his new best friend Ron, who is quick to shove aside his boring old sandwiches from home. When Lucy first arrives in Narnia, she's invited to share afternoon tea with a quaint little faun named Mr Tumnus. For such a strange new world, he tempts her with very British sounding treats, including lightly boiled brown eggs, sardines on toast, toast with honey, and sugar topped cake. The afternoon tea turns out to be a bait, so he can summon the wicked queen of Narnia, who has always been on the lookout for boys and girls. But Mr Tumnus changes his mind in the nick of time, since he's taken a shine to Lucy. Amy wants to treat the girls in her drawing class to a tea party. Apart from plain old cake, sandwiches, fruit and coffee, she insists on the addition of cold tongue and chicken, french chocolate and ice-cream, because that's what her guests are used to. But after all the expense and preparations, only one girl bothers to show up. I would have liked to be in her place, except for the cold tongue, which I don't fancy the sound of at all. Reviews are here and here. Although it doesn't happen quite the same in the book, one scene sticks in my mind from the old movie with David Niven. Phileas Fogg and Passepartout are drifting in their hot air balloon through some European alps, enjoying a leisurely afternoon tea in the basket, including a good drop of wine. The acrobatic Passepartout manages to scoop some snow from a passing branch to ice their bottle. I've reviewed it here. She's from one of my favourite kids' series. Hazel needs to ask an urgent favour of Yakov, the strange new boy who has moved into her apartment building. She doubts he'll be easy to convince, especially since she's always shunned him in the past. Luckily she has a friend named Mr Volio who is the best baker in town. Together they bring a mobile tea party to Yakov's house, including all sorts of delicious cakes and pastries. Reading these stories are enough to make my mouth water. I've reviewed them here. Not many people I've met have read Hazel Green, but the situations she finds herself in are fantastic for kids and adults alike! It's the type of book series we love when we're tiny, then revisit when we have little girls of our own. Uncle gives Milly-Molly-Mandy a cute dolls' tea set, and she gets permission to invite her little friend Susan to share afternoon tea. But halfway to Susan's house, the girls meet up with the exact same story. Susan's father has given her a tea set too, and she wants to invite Milly-Molly-Mandy. It takes their friend Billy Blunt to solve the dilemma. He suggests that they combine the tea parties, as long as he can stay to share the 'special little cake, proper little loaf, tiny little tart', some bread and jam and lots of dripping. This may be one of the most surreal tea parties ever. Lazlo Strange and his lover, Sarai the 'muse of nightmares' can only meet in his dreams at night. His gentle and colourful dreams become an oasis from the real world, which is full of strife and danger. On one night, he treats her to a tea party beside her dream river, and they both try to conjure up a lovely flavoured cake unsuccessfully, because neither of them have any gauge to base it on. He's never tasted cake at all, and her last treat was as an eight-year-old. However, they manage to do a pretty good job, also with pouring of tea from the dream teapot. Do you enjoy living it up at the occasional tea party yourself? Looking down my list, I think the most significant thing about them is friendship. All the politeness and refinement is really just an excuse to strengthen bonds and create memories. 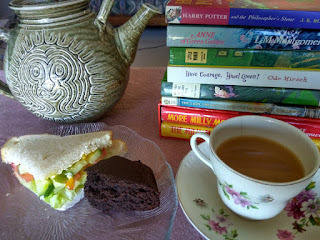 If you can think of any other good tea parties, or if any of the ones I've mentioned strike a chord with you, please share your thoughts in the comments. And if I could, I'd treat you all to afternoon tea at my place. And of them all, my favourites are Milly Molly Mandy's gentle socialising and Anne's disastrous episode with drunken Diana. Speaking of MMM, I saw a lovely boxed set of those bright red covers about 5 years ago and bought it to read the stories to my then 5 yr old Grandie. She was bored rigid. That barely-touched set is now at Books in Clover. I mourn for it! Hi Rhonda, I love MMM too. I had all the books as a little girl, and was so pleased when one of my 3 kids turned out to be a girl, so I could read them to her. She quite enjoyed them, but they're tame compared to the stories she enjoys these days, aged 18. The drawings, combined with the dose of Britain we get in the stories is a winner. I remember driving through the Cotswolds on my trip years ago and thinking all the villages looked like MMM's. It was MMM's imagination using the most ordinary of things - her granny's (mother's) button tin and the book of fabric samples - had me collecting both for years, and weaving tales around them. I've had more than one 'Afternoons with Anne' as we've enjoyed afternoon tea while watching my favorite redhead onscreen! Hi Paula - I'm glad you have Lucy's visit to Mr Tumnus in there - something that came immediately to my mind, though's Anne's disastrous tea party was quite momentous. I love Marissa Meyer's take on the Mad Hatter's tea party in Heartless (an origin story for the Queen of Hearts). I do remember as a 5 year old receiving a tea-set for Christmas and bursting into tears because I did get Tonka trunks like my two brothers. Hi Jenny, I always get the impression that C S Lewis would have loved his food, just from the way he describes all the tasty treats.I really must bump Heartless higher on my tbr pile.